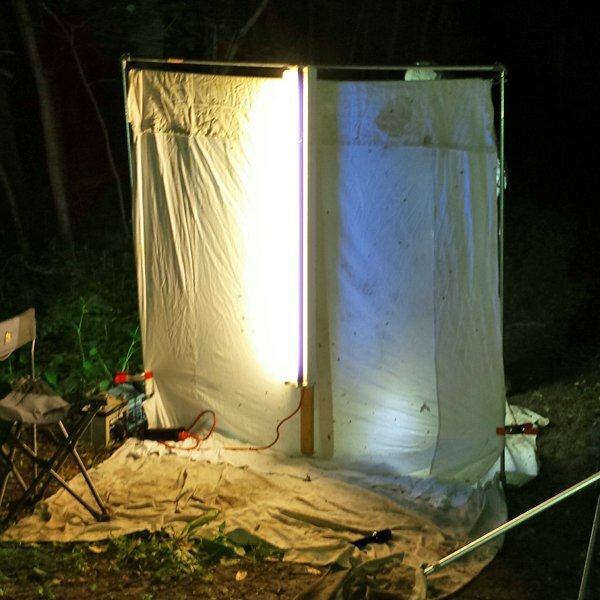 Night Lighting - This is one of the setups that I have used in the past for blacklighting. I took a full size flat sheet and sewed a curved slot in the end of the sheet. 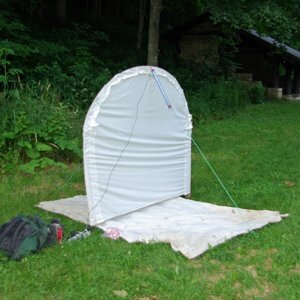 I then took some tent poles and tied them together till they were long enough to fit through the slot in the sheet. I place two metal electric fence poles in the ground spaced the width of the sheet and then slide the sheet over the poles. There is a small rope sewed to the center of the top on both sides which runs to a loop that I tie to the ground with a tent stake for stability. For lights, I use a 4 foot electric light fixture. I use the one that uses T8 light bulbs. One is a black light and the other is a normal white flourscent light. The fixture is mounted perpendicular to the ground. The fixture is powered by a Tripplite Powerverter (375watt) which is hooked through a cigarette lighter adapter with clips to a Werkel WKDC12 35J battery. The inverter and battery can be purchased from Batteries Plus. I use a Schumacher XCS 15W battery charger that I purchased from Walmart to charge the battery. 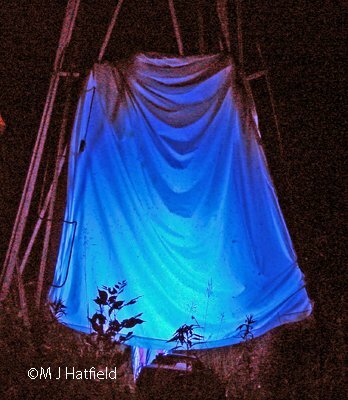 I also put a sheet on the ground to catch insects that land or fall off the sheet. 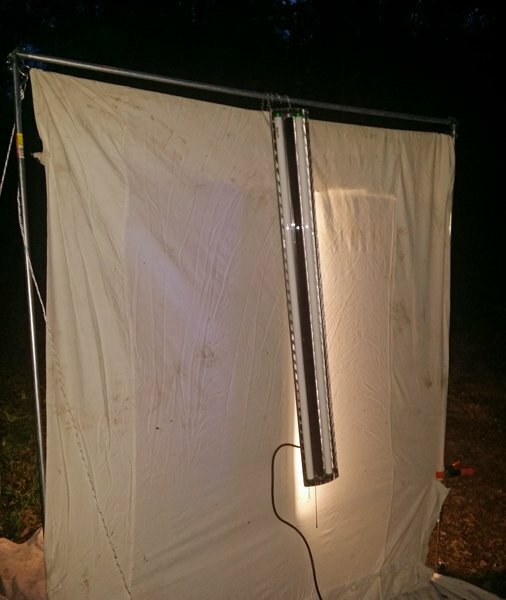 I previously used some 15 watt lights that I purchased from BioQuip. 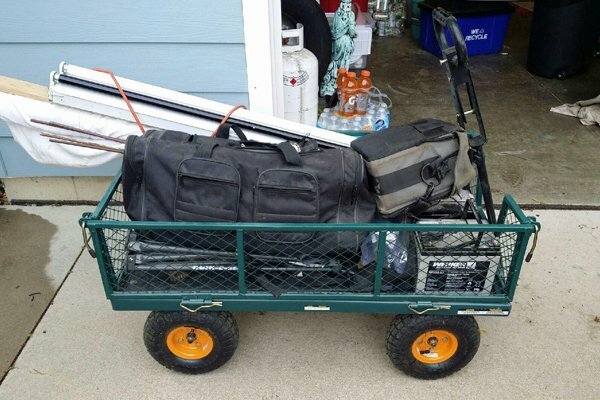 If I am going to travel a ways to my collection point, I use a wagon that I purchased from Menard's that allows me to haul all my stuff in one trip. The wagon has pneumatic tires which work better than hard rubber ones. The other method for the sheet is to make a frame out of 1/2 inch electrical conduit with right angle fittings at the corners. The fittings have screws that can be loosened and then tightened after the pieces are fitted together. The sides are 5 feet and the top 5 feet. The top piece is slid through a slot in the top of the sheet and then attached to the side pieces. The side pieces are slid over two electric fence poles. This method does not require the tie downs for stability but may be needed if windy. I use a couple big squeeze clamps to fit over the metal poles and clip to the sheet at the bottom to hold it to the frame. I also lay a sheet on the ground after spreading a piece of plastic down on the ground. The plastic helps to keep the sheet dry if the ground is wet. 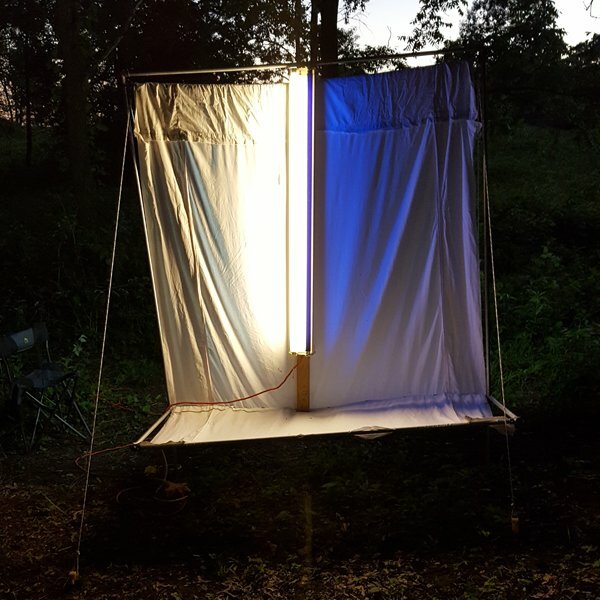 The light fixture can be hung from the metal frame and a second fixture may be added to shine light both ways from the sheet. After using a couple times, I ended up drilling holes in the conduit where the screws touch the conduit. This helps in aligning the pieces as I assemble. I also lettered the joints and then just have to match the letters. It takes about five minutes to put the assembly up. I also mounted conduit hooks to the lights and then just have to hook the lights over the top rail instead of using the chain I had used. I made a modification to the above setup so you do not have to get on the ground. About a foot up on the poles I stick into the ground, I place a stop so the frame stays off the ground. I added extensions to the front and back of the frame. I added a sown slot to the sheet on one side and then added a piece to the other side. The extensions hold the bottom of the sheet out two feet and keep the bottom a foot off the ground. With this setup I have to add tie downs because the fixtures do not touch the ground and need the stability to keep the setup vertical. 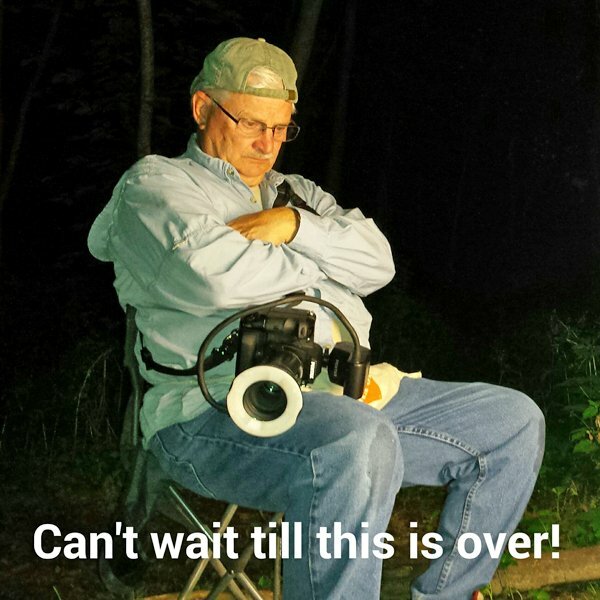 This allows me to use a small stool to set on and take pictures low on the sheet. 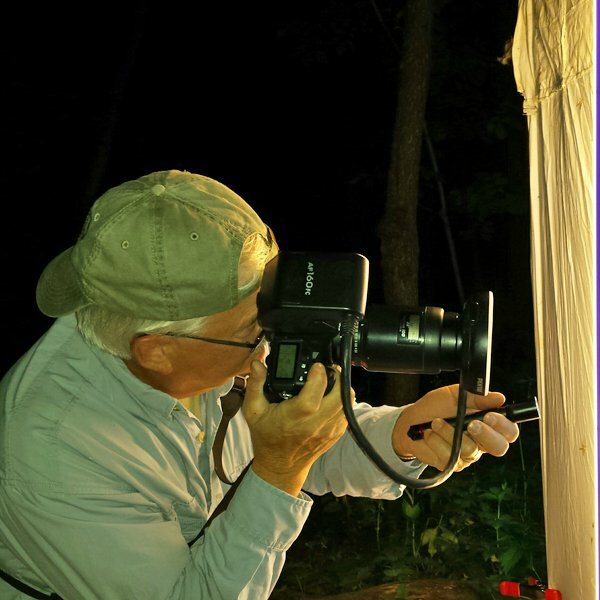 Photos of me taking pictures of a moth on the sheet and setting in a chair waiting till the next round of photos. Photos by Aaron Eckley. 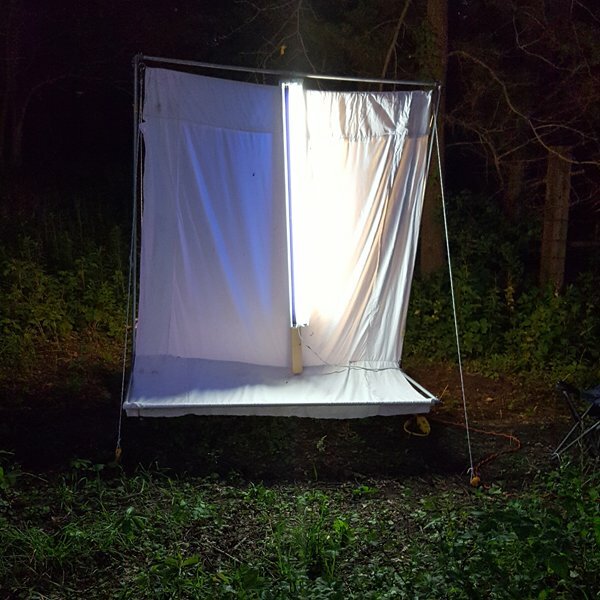 You can also tie a sheet between two trees if you are in the woods and can find a couple that are spaced the right amount. This is a picture of the wagon that I purchased at Menard's. The pneumatic rubber tires are nicer than hard rubber on some wagons when pulling it across rough ground. It contains my light fixture, battery, electric fence poles, chair, bag with camera, water, snacks, flashlights and collecting supplies.